For Google, seasonality is an important factor in forecasting quarterly revenue growth. In the advertising business, Q4 is always the strongest, followed by Q1. Q2 is the weakest. In Google’s latest financial year, the difference between the weakest and strongest quarters was 22%: $14.4B in Q4 and $11.8B in Q2. I wondered if the same were true for SaaS companies. Should SaaS startup forecasts account for differences in underlying customer purchasing habits? While not subject to the consumer buying holiday cycle like advertising based companies, SaaS salespeople might be impacted by the vacation schedules of their customers or some other factors I couldn’t anticipate. 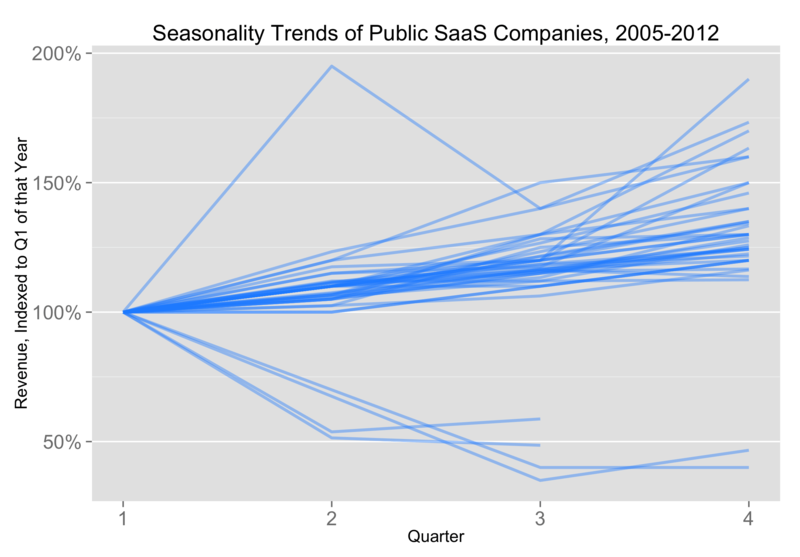 But the data show seasonality is largely irrelevant to SaaS companies, even the very largest ones. Below I’ve charted the quarterly revenue growth patterns of the 40 or so publicly traded SaaS companies. I’ve indexed revenue growth to Q1, meaning a Q2 value of 200% implies a Q2 that is twice as large in revenue as Q1 and so on for each subsequent quarter. While there are outliers whose Q4s are the worst performing quarters (Ariba, BazaarVoice, E2Open and Concur), the vast majority of public SaaS companies grow through the year, unfazed by the summer doldrums of Q3 and the holiday slowdown in Q4. Below is a table with the average revenue by quarter indexed to Q1. Across all public SaaS companies, Q4 is on average about 28% larger than Q1. I suspect some of the strength in Q4 might be budget liquidation. Before year end, VPs may find excess funds and seeking to maintain their budget size for next year, stuff additional SaaS products into their budgets. But otherwise, revenue seems to grow at a fairly consistent pace. This table makes plain one of the benefits of the recurring revenue model: predictability. The linearity of revenue growth across sectors and ages of companies implies SaaS companies aren’t subject to the same seasonality forces of other segments and sectors.